If you are a professional alpinist (which I’m not), you would probably opt for some sort of the first accent, or a speed record, or at least going up without oxygen. And I’m taking my hat off. Being a mere mortal amateur, the first accent was not on my radar. Instead the choice was: “South route through Nepal” or “North route through Tibet” ??? During the preparation phase we spent hours discussing the pros and cons of both scenarios, weighting risks vs the scenery vs the technical difficulty vs the camp’s altitude and the methods of approach. If you are not outfitting your own personal expedition, make your decision in other way – first select the expedition you want to join and it will determine the route automatically. Honestly. Because the quality of the Outfitter will determine the level of safety, the level of professionalism and who your climbing mates are. It will determine your whole experience on the mountain, and, minding the length of the expedition, you want to climb with right guys! Since, to my knowledge, no one operates from Nepal and Tibet at the same time, determining with whom you go will automatically give you the route. If you still want to go through the pain of choosing the route first, here is my personal opinion about the South Col vs the North Col after being on the South Col myself and talking to several alpinists who have summited from both sides as well as outfitters operating from Nepal and from Tibet. While approach in Nepal goes through Khumbu Valley – a green valley that enjoys warm air from India, that warm moist air is stopped by the Himalayas and do not penetrate to Tibet. Thus, Tibet is more of a dry and windy place. From Tibet side – you have an option of flying from Kathmandu to Lhasa and driving to the Base Camp, or driving all the way. Seeing Lhasa is a unique and very tempting addition to your trip to the Base Camp. From Nepal side – you fly from Kathmandu to Lukla and hike-in on foot 65 km to the EBC. I think trekking provides good physical and mental acclimatization for the climb ahead. It is also fun and a unique experience. Some say trekking increases risk of getting sick with GI or something else, thus undermining your performance up on the mountain. Possible. But definitely not more dangerous than living / eating in the EBC, providing that you wash hands and do not eat from the ground. The level of service in the teahouses improves every year and the food they provide is more than acceptable. On both sides it is possible to catch GI bug, and if it happens, do not rush with antibiotics. Wait for 12 – 24 hrs, use mild medicine, drink plenty and give your body chance to clean the system without bombing it with hard stuff. After the expedition, on the way back, romantic trekking in Nepal may turn to disadvantage due to the unstable work of Lukla airport. Close to monsoon season expect up to 7-day flight delays or budget extra for a helicopter. Exceptions are rare. You can also fly heli out from Pheriche or Namche at a very similar cost as from Lukla. When planes stop flying due to overcast in Lukla, helicopter price is not a factor of distance, but a factor of demand = how many days Lukla airport has already been closed. Cheap alternative is to hike down for 3 more days from Lukla to Jiri and travel on by bus. I guarantee you will not be up to it after 2 months on a mountain. The North side provides much better predictability with travel to Lhasa /Kathmandu, no matter if you fly or drive all the way. On the South side the Everest Base Camp (EBC) is 5300 m high and the Advanced Base Camp (AEBC) is around 6400m, also called “Camp 2”. On the North side, teams live in the AEBC for prolonged period of time. Many say it provides better acclimatization, but it is arguable if at that altitude your body rests and recuperates well. What is certain – the North side is much drier, putting greater load on your respiratory system. There are risks you can control and mitigate and the risks you can’t. 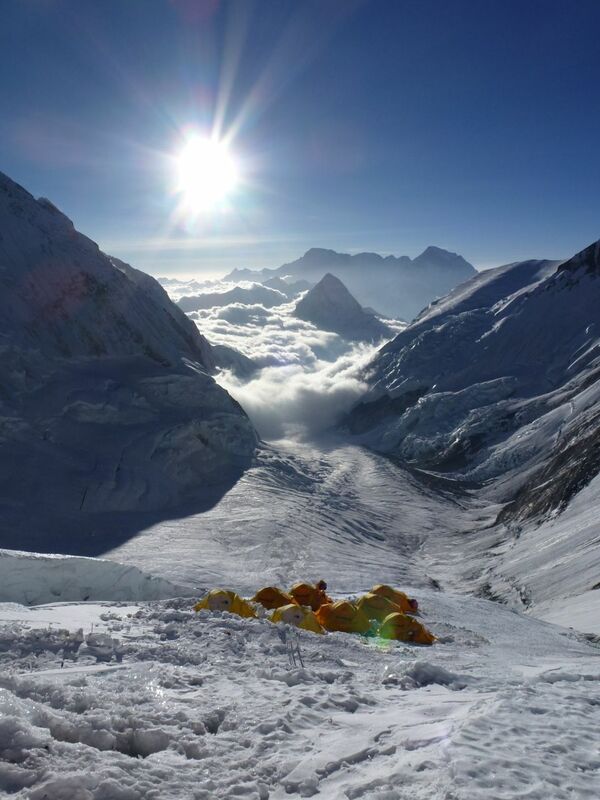 One high risk/ low control area is the Khumbu Icefall on the South Route to Everest. While it is visually stunning, it is a very dangerous place on the mountain that you will have to cross at least 6 times. The North Route does not posses such a risk. Wind is another factor. Here, in turn, it seems that the North Side has more windy days during the climbing season. It used to be acknowledged that the North Side is a more technical route. That comes from 2 technical patches on the way from Camp 4 to the Summit, known as the First Step and the Second Step. Minding the altitude, it was originally a very challenging technical obstacle. Nowadays it has fixed ladders. Put by Chinese in 1975 and changed several times since then, the ladders are a bit of a bottle neck, but the climb is technical no more. In fact the ladders have turned things around and many say that nowadays the steeper South Ridge and longer summit day from the South Col provides higher challenge in comparison with the more mellow and short route from the North Col.
Traffic on Everest has been a hot topic over last years. And it is more of an issue from The South, since more climbers attempt the Mountain from Nepal. From the South Col to the Summit there are few free-climbable spots where you can take over, but most of the route you’d better be clipped to the line. It is even more so during dry years, when you have to climb exposed rock. The Hillary Step on the South (and potentially more spots on the summit ridge) is as bottle neck as the First & the Second Steps on the North. You see, there are pros and cons and you have to weigh them up, to consider which factors are more important for you, basing on experience, health, time schedule.